Beremend is located 45km southeast of Pécs and borders on Croatia. Close to the village, near the street to Kásád, lies Hungary’s southernmost point. One of the most decisive battles of the Ottoman Wars was fought near Mount Harsány on August 12th 1687. It ended with the Imperial victory and field marshal Count of Veterani was given Beremend (German: Berend, Coratian: Breme) for his services. At first, the area was mostly settled by Serbian families and some Germans, who were producing quicklime from the local limestone. In 1749, the hamlet was given to the Esterházy family by Maria Theresa. Under their supervision, the village was populated by Germans, Serbians and Magyars. Furthermore, the oldest Jewish community of Baranya emerged in Beremend. The Jewish cemetery was moved to Pécs after World War II. The different ethnic groups did not live in total isolation, but developed ‘islands’ within the village. The religious life was diverse as well, as the three churches of Beremend still reflect today: a Catholic, a Reformist and an Orthodox church can be found. From the mid-nineteenth century onwards, Beremend belonged to the family of Schaumburg-Lippe, who drained the wetlands of the Danube and erected a dam. In 1910, the Portland-Cement- and Limestone-Factory contributed to the modernisation of lifestyle and economy in the region. The same year, a railway connection and a telephone line were established in the village. During the interwar period, the multi-ethnic village saw the foundation of multiple associations and a sports club is still in existence today. Most of the local German-Hungarian families were displaced to Germany on Whitsun 1946. If one follows the track left of the Catholic church up the vineyard, one can find the ecumenical Chapel of Reconciliation which was built between 1993 and 1998 and initiated and financed by displaced Germans. It was consecrated by Roman-Catholic and Calvinist reformed bishops from Hungary and Croatia on Whitsun 1998. 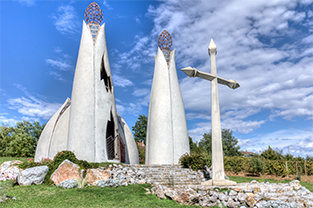 The Chapel symbolises peace and reconciliation between ethnicities and religions and commemorates the sorrows of the displaced Germans and the cruelties of the Yugoslav Wars. The ecumenical Chapel of Reconciliation symbolises peace between ethnicities and religions. erenc Mendele (1934-1994), who came from a family of Germans of Hungary, is one of the most famous persons of the village. Mendele was an architect and director of the Hungarian department for monument preservation. His life’s work is exhibited in his birthplace, which was turned into a memorial house in 1996.